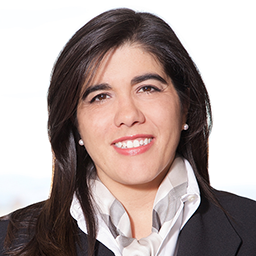 Juanita Acosta has been a partner for the Firm’s Intellectual Property, Consumer Protection & Privacy group since 2008. She is an attorney from Universidad de los Andes, Bogotá and was admitted in Colombia in 1994. She is an International Contracts Regime Specialist from Universidad de los Andes, Bogotá (1998) and has a Masters in Industrial and Intellectual Property and Information Technologies from Universidad Alicante, Spain (2001). She has been recognized in major legal international directories and has over 20 years of experience managing complex IP Portfolios for multinational and local Companies. They have recognized her solid and deep knowledge of IP matters, IT matters and high quality standards. Clients appreciate her approachability, commitment, and detailed analysis, which is evident throughout her legal work. Her clients include a wide range and variety of consumer products companies in the technology, food, and cosmetics fields, as well as in the aviation and infrastructure fields, among others. She has experience advising them on their intellectual and industrial property portfolios, both in their selection and protection, including patents, copyrights, trademarks, consumer protection, promotional activities, warranties, advertisement, regulatory matters, entertainment, and privacy. She assists clients with the design of policies and mechanisms to enforce IP (globally and regionally), as this is a competitive tool for clients in the market. Likewise, she has advised clients on international commercial agreements, e-commerce terms/online consumer-facing sales terms, social media and mobile messaging platforms, privacy issues as well as on all consumer protection issues involving advertising, warranties, sweepstakes, etc. Currently, Juanita is a National Delegate in Colombia for ASIPI in the 2015-2018 term, and is a co-chair for Colombia in the IAPP.